Sometimes it is not enough to have ideas or speak words, no matter how true they are. There are circumstances that require us to act in order to respond properly to them. There are challenges in life that we must enter into personally if we are really going to engage them. They require us to invest ourselves in them fully; otherwise, we end up fooling only ourselves. Palm Sunday is like that. Jesus Christ had to enter into Jerusalem, being hailed as a conquering hero after raising Lazarus from the dead, in order to fulfill His ministry as the true Passover Lamb Who takes away the sins of the world. That was the only way to make clear the radical difference between the anticipated earthly king of the Jews and the One Who reigns from the Cross and a tomb that ultimately cannot contain Him. The Savior did not simply think about going from being celebrated as a righteous military leader to being killed as a blasphemous traitor within the short space of a few days. He actually experienced it in order to set us free from the fear of death and make us participants in His eternal life. He did so purely out of love for us. When He wept at the tomb of His friend Lazarus, He was mourning for us all who are enslaved to the misery of corruption and decay in all its forms. Christ’s love is not limited to a feeling or an idea, for He literally laid down His life in order to restore us to the holy joy for which He created us in the first place. That kind of love requires commitment, action, and self-sacrifice. The Lord offered Himself completely, without reservation of any kind, to set right all that had marred and distorted our original beauty as those created in God’s image and likeness. He rejected the temptation to play to the desire of the crowds for a conventional ruler, and instead won His great victory in the most shocking way possible through His own rejection, death, burial, and resurrection. He entered into it all in order to heal, bless, and save fallen humanity, indeed the entire creation. The Savior had raised Lazarus from the dead, thus showing that He is the resurrection and the life. Lazarus’ sister Mary prophetically anointed Christ for burial, even as those who saw Him as a threat to their power plotted to kill both Him and Lazarus. In contrast, the One Who offered Himself as the true Passover Lamb sought no earthly power at all. Even as the crowds welcomed Him with shouts of “Hosanna! 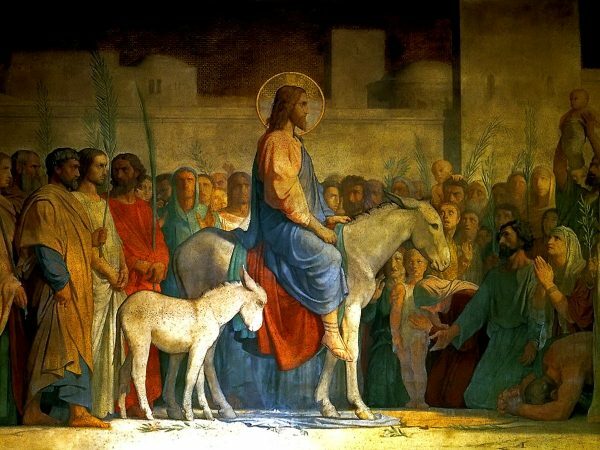 Blessed is He Who comes in the Name of the Lord, the King of Israel!” in hopes of liberation from Rome by a ruler like King David, this Messiah rode into town on a humble donkey. He is not a fearsome warrior, but the Prince of Peace. Jesus Christ entered Jerusalem not merely as a great human being, but as the Son of God. Being fully aware of the rejection, torture, and death that would come in the next few days, the eternal Word Who spoke the universe into existence went into Jerusalem as a lamb led to the slaughter. He knew exactly what He was doing and what others would do to Him. Out of love for us, He intentionally offered Himself as a ransom in order to set us free from slavery to the fear of the death and all its malign effects. Our Lord is not some kind of distant god who delights in making others suffer. He is not a typical political or national leader who wants only to build up his own power and glory. He is not a self-righteous legalist keeping score of who deserves punishment or a reward. Instead, He freely takes upon Himself the worst and most painful dimensions of life in our world of corruption in humility beyond our understanding. The same Son of God Who wept at the tomb of His friend Lazarus will Himself lie in a tomb and descend even to Hades in order to look for His ancient friends Adam and Eve, lifting them up from the pit and bringing them to the blessedness for which He made them in His image and likeness. In doing so, He sets us all free from slavery to sin and death. That is how Jesus Christ has enacted our salvation, how He has accomplished it through His own flesh and blood. It is an understatement to say that His death and resurrection required His personal participation. He gave Himself fully, without reservation of any kind, in order to save us. And if we want to know His salvation, if we want to know Him, that will require our personal participation also. Holy Week invites us to participate personally in the deep mystery of the Savior’s great victory on our behalf. Through the services of the Church, we participate mystically in the triumphant entry of the Prince of Peace into Jerusalem, even though He triumphs in a way that still makes no sense according to the standards by which we usually live our lives. This week we will prepare to receive the Bridegroom when He comes to invite us into the joy of the Kingdom. We will receive His Body and Blood as He institutes the Holy Eucharist on the night in which He was betrayed. We will follow Him as He is rejected, abused, and crucified—as He dies, is buried, and descends to Hades. We will sing dirges at His tomb and then stand in awe when that same tomb is empty and He arises in glory. Now is the time to lay aside our earthly cares as we make faithfulness to our Savior the highest priority of our lives this week. He did not shrink from going to the Cross for us, and we must not abandon Him by saying that we already know what happened two thousand years ago or simply have better things to do. No, we must enter into the deep mystery of our salvation by investing ourselves as fully as possible in the journey of our Savior from the welcoming crowds of Sunday to those that yelled “Crucify Him!” on Friday. We must kneel in humility at the foot of the Cross and sing lamentations at His grave if we are to have the eyes to behold the brilliant glory of a Savior Who rises in victory. This week is one of those times not to rely on mere thoughts, feelings, or good intentions. It is a time to act, to be committed, and to refuse to ignore the One who conquers death and Hades for our salvation. It is a time to offer ourselves to the Lord Who offered Himself for us purely out of love.